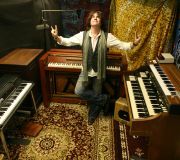 Los Angeles based BOB MALONE plays keyboards with rock legend John Fogerty, and continues a long running and successful solo career. His sound is a one-of-a-kind hybrid of rock, blues, and New Orleans R&B, delivered with high-energy piano virtuosity and a voice all his own. In addition to his Fogerty band duties, he plays over 100 solo shows a year across the globe, and has played with or opened for Bruce Springsteen, Rickie Lee Jones, The Neville Brothers, Rev. Al Green, Dr. John and many others. Bob tours the US, UK, Europe and Australia extensively, including sets at Glastonbury Music Festival (UK), Colne Blues Festival (UK), Long Beach Bayou Fest (US), Falcon Ridge Folk Fest (US), Blue Mountains Music Fest (AU), and Narooma Blues Fest (AU). And at New Orleans Jazz & Heritage Festival, he has played the legendary WWOZ Piano Night for two years running. Mr. Malone is the keyboardist on the latest John Fogerty album Wrote A Song For Everyone – playing on a brand new Fogerty tune, a revamped “Lodi” (recorded at Abbey Road Studios in London), and John’s duets with Bob Seger, Miranda Lambert, and Keith Urban. Bob’s TV appearances with John Fogerty include The Late Show With David Letterman and The View. His own music is heard regularly on Dr. Phil, Entertainment Tonight and The Rachel Ray Show. Malone’s six CDs have earned Top-20 spots on the Living Blues, Roots Music Report and Earshot radio charts, and are played on stations worldwide, including Sirius/XM’s Bluesville, and NPR favorites Car Talk, Acoustic Café, and Woodsongs Old-Time Radio Hour. Bob Malone is endorsed by QSC Audio, Hammond Organ and Fishman Acoustic Transducers. His brand new Mojo EP was released this summer in the UK to rave reviews, and the Mojo Deluxe album will be out worldwide in early 2015.